Moscow and Caracas stand for forming a fair world order that would not depend on the wishes and prosperity of just one country, President Medvedev said, following talks with Venezuelan leader Hugo Chavez. According to Medvedev, Russia and Venezuela share a similar stance on many international problems, including combating terrorism, crime, drug-trafficking, addressing ecological challenges, and global economic development. Medvedev believes that is the only kind of world order that would provide for steady development of humanity in the 21st Century. He noted that Moscow and Caracas are always in contact on such pressing matters and manage to find common ground. “We will keep doing so and continue coordinating our foreign policies in accordance with international law and giving the leading role to the United Nations,” he added. Hugo Chavez, who is on his ninth visit to Moscow, held talks with president Medvedev on Friday, to plan Venezuelan-Russian partnership up to 2014. As a result of the talks, a whole bunch of important agreements have been signed in areas such as energy, defense, finance ventures and construction. One of the most crucial agreements is on Russia building a nuclear power plant in the Bolivarian Republic of Venezuela. According to Medvedev, nuclear energy is Russia’s priority and the country builds atomic power stations in many other countries. “Why not build such a station in Venezuela? Venezuela is our close partner. In addition, [having a nuclear power plant] provides for a certain extent of independence in case prices for some kinds of fuel drop,” the president said. The Venezuelan President also spoke of independence, though mainly focusing on his country’s freedom on a larger scale, rather than just energy. He thanked Russian partners for their help in consolidating Venezuela’s independence and helping it to be free of restraint. “We live in the sea of oil. Nevertheless, the population lives in poverty,” adding that imperialism should be blamed for that. Chavez went on to say that his country is at the very beginning of the path to “complete emancipation” and that agreements with Russia will help Venezuela along that path. The leaders also agreed that while economic relations between Russia and Venezuela are at their peak, there is room for bilateral trade to develop further. Medvedev said that Russia, for instance, could ship its cars to the South American country, while Venezuela could sell food products to Russia. He specifically underlined that investment of hundreds of millions of dollars in banana production alone will lead to the creation of up to 20,000 jobs. In what seemed to be part of an advertising campaign for Venezuelan goods, at the end of the conference, Chavez opened a large bag and took out of it banana jam and chocolate bars which he handed to Medvedev. “Look, I’ve brought Venezuelan chocolate. It is the best in the world,” he said, adding that he would like it to be sold throughout Russia. “Then it will be cheap, too”. Both leaders are unanimous: the partnership between Russia and Venezuela can be dubbed strategic. “The difference between strategic partnership and just good economic cooperation, lies not in large turnovers and big deals. We also support each other on the international arena, coordinate our positions and try to protect each other,” President Medvedev stated. The Russian leader praised Venezuela’s stance on South Ossetia and Abkhazia. Russia recognized the independence of the two republics shortly after the August 2008 war, which began when Georgia attacked the South Ossetian capital, Tskhinval. Venezuela became one of the few nations that have so far joined Russia in recognizing South Ossetia and Abkhazia as independent states. Speaking Friday, Medvedev recalled, that back in July this year, Caracas established diplomatic ties with the two republics. The move, the Russian leader stressed, is not only an important step on the republics’ way to gaining their legal status, but also “a symbol of friendship between our states”. “That is how true friends should behave: when they promise something, they do it, not just chat about it,” he said. Prior to the talks at the Kremlin, Chavez took part in a ceremony for the laying of the foundations of a monument to Venezuela's national hero Simon Bolivar, in southwest Moscow. There was a move away from the traditional presidential motorcade, as Chavez traveled through the capital in a Russian-made car, a red Lada Priora. Later, speaking at the joint media conference, he recalled that 20 years ago he used to have a Russian “Niva” off-road vehicle, which he quite enjoyed driving. He pointed out that the car is quite economic in terms of using petrol and he specifically underlined that its price is very reasonable – “$7,000, it is very cheap”. “Dmitry, I would like you to know that the West sells us cars as good as that one for $20,000 and more. 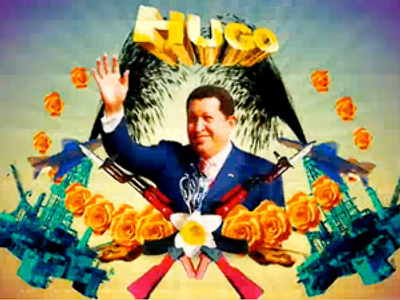 They are exploiting us,” Chavez stated. "The USSR has not disappeared"
Venezuela’s president arrived in Moscow on Thursday, on the first leg of his six-nation diplomatic tour in Eastern Europe and the Middle East. After being greeted at the capital’s airport, Chavez went to Moscow's Library of Foreign Literature to give a speech at the conference entitled Two Centuries of Latin America's Independence. In his traditionally emotional manner, the president spoke of his “delight” at Russia and its people, and also Venezuela’s resistance to “Yankee’s empire aggression”. He also touched upon his country’s plans to develop nuclear energy, which he said would be purely for peaceful purposes and not aimed at creating an atomic bomb. According to Chavez, the collapse of the Soviet Union was undoubtedly a “catastrophe”. “It seems to me that the USSR has not disappeared,” he went on. “How can a revolution that created such a powerful country disappear at all?” This revolution together with the country “had transformed into a new generation of peoples who inhabited the Soviet Union,” Chavez stated. These peoples embody the new world’s power and are “embarking on a path of new, long history”. Venezuela “is genuinely delighted at Russia, its people and its history that lives on,” he said. Later in the evening, Chavez had an informal dinner with President Dmitry Medvedev at his residence in Gorki. The two discussed current issues in Russian-Venezuelan relations, the Kremlin press service reported. Presidential Aide Sergey Prikhodko, Deputy Prime Minister Igor Sechin and Foreign Minister Sergey Lavrov were also present at the meeting.